U.S. President vows that if his dealings with Russian President Vladimir Putin don't "work out, I'll be the worst enemy he's ever had." 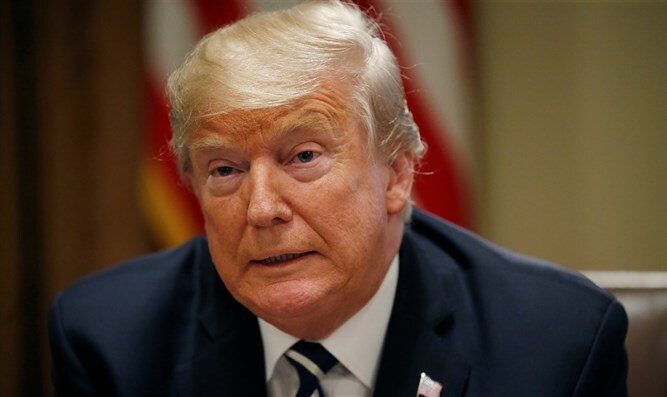 U.S. President Donald Trump vowed on Thursday that if his dealings with Russian President Vladimir Putin don't "work out, I'll be the worst enemy he's ever had." The President’s comment came during an interview at the White House with CNBC that will air in full on Friday morning. In the same interview, Trump blasted his predecessor, President Barack Obama, for having been a "total patsy" for Russia, while claiming he has been "far tougher on Russia than any president in many, many years." At the same time, Trump also said he valued the opportunity to improve the United States' relationship with Russia, even after American intelligence agencies have said that Russia repeatedly tried to interfere in the 2016 U.S. presidential election. "Getting along with President Putin, getting along with Russia, is positive, not a negative," Trump told CNBC. Trump caused an uproar earlier this week when, during a press conference with Putin, he appeared to back Putin’s claims regarding Russia’s meddling in the 2016 presidential election. On Thursday, White House press secretary Sarah Huckabee Sanders tweeted that Trump had asked National Security Advisor John Bolton to invite Putin to Washington in the fall. The president's interview with CNBC also came on the heels of a New York Times report that said Trump, two weeks before his inauguration in January 2017, had been shown extensive evidence that Putin personally ordered interference in the 2016 U.S. elections. In his interview Thursday, Trump ticked off several actions that he said rebut any argument that he is under Putin's thumb. Those actions include his urging German Chancellor Angela Merkel last week to withdraw support for a new gas pipeline that would bring gas from Russia to Germany across the Baltic Sea. Trump had called Germany "a captive of Russia" because its reliance on Russian energy sources. "I said, wait a minute, we're supposed to be protecting you from Russia and you're paying them billions of dollars. What's that all about?" Trump told CNBC. "Now, you think that's a positive for Russia? I'm talking them [Germany] out of things that they [Russia] were given billions of dollars. It's ridiculous, by the way, that that's happening," he added. Trump also urged people to "look at the sanctions I put on" Russia," referring to several different sets of financial sanctions imposed by his administration on Russian oligarchs, companies and government officials. "Look at the diplomats I threw out. Look at all the things that I have done," he insisted. Turning to Obama, Trump criticized his policies vis-à-vis Russia. "Obama didn’t do it," Trump said, comparing his efforts to his predecessor's. "Obama was a patsy for Russia. A total patsy." Trump also mentioned an incident in March 2012, when Obama, apparently unaware that his words were being caught by a live microphone, told then-Russian President Dmitri Medvedev that Obama would "have more flexibility" after the presidential election in November 2012 to negotiate with Russia's incoming president, Putin, on the issue of missile defense. "Look at the statement he made. He thought the mics were turned off okay, the stupid statement he made," Trump said. "No one makes a big deal of that." "Getting along with President Putin getting along with Russia is positive, not a negative. Now, with that being said if that doesn’t work out I'll be the worst enemy he's ever had – the worst he's ever had," he stressed.